We now have Guvnor displaying uploaded Drools Flow files. We use the native GWT XML api to read in the XML document and GWT Diagram to generate the diagram. At the moment it's view only, over time we will make it editable - which will sure beat round tripping with Visio that other platforms do. What purpose of Drools Flow, why not use jbpm, where it fits and what relationships it has with jbpm? They should provide more detail. The upshot is a belief in different approaches, we believe in a unified approach jBPM doesn't and we haven't been able to reconcile this difference. Than you for your comment, i admire you way. 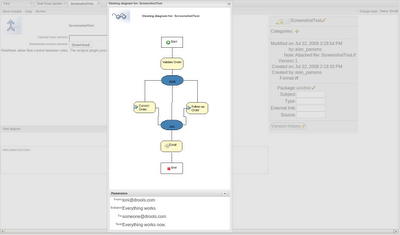 Are any roadmap for Drools Flow, for example standards like BPMN implementation? We have a partial BPEL implementation that I would like to see finished, and someone is documenting the mapping of BPMN - but it's all a long term effort. You might want to get Bisbane on your team first, if you decide to go the boxing route. Though technically, Bisbane isn't a boxer, he is a MMA guy. Is it possible to draw Gwt based jBPM designer? Currently i am looking to design the jBPM work-flow using GWT. to transplant eclipse RCP to GWT WEB.